Looking For The Best Mig Welder? Our team of experts have selected the Best Mig Welder out of hundreds of models! Learn how to choose a mig welder and find out our top picks for the best mig welder in this guide. Welding may appear intimidating and difficult to learn at first, but not until you learn how to use a Mig welder. Mig stands for metal inert gas, and is an entry-level universal welder. As such, it can easily be learned even by neophytes and used for simple repair jobs in and around the home. Mig welders are easy to use. Simply plug the unit, crank up the gas shield, and start welding. Some first-time users can run good beads using a mig welder in just a couple of hours. Instructors can even give basic training in less than an hour. A mig welder makes use of wire welding electrode on a spool. It can bond together metals such as aluminum, copper, mild steel, stainless steel, nickel, and magnesium, as well as their alloys. But just because a mig welder is easy to learn, doesn’t mean that you just buy a unit that you find online. The following are the things you need to look for in choosing a mig welder. Simply put, the power of the mig welder must be enough to weld the kind of material that you are dealing with. Thus you must also have an idea of the metals that you are likely to put together, and buy a device that can weld it. For instance, a mig welder with 30 amps would be able to weld up to 1 mm sheet. A unit with 20 to 25 amps would be more suited for thinner sheets. If you’re working with ¼ inch of steel, you need a unit with at least 140 amps. If you are to bond together thicker materials that are up to 2 mm thick, the welder should have at least 40 amps. When shopping for a mig welder, you will notice that the units come in 115 volt and 230 volt models. It can be confusing because we’re accustomed to hearing 110 volts or 220 volts. But don’t get confused as the welders can operate with up to 10 percent variance in input voltage. So if you buy a 208 volt mig welder, it would still work in a 220 volt outlet. A 110-volt wall outlet is normally rated at 15 to 20 amps. On the other hand, a 220 volt outlet is often rated at 40 amps or more. You can also refer to the electrical panel to determine how much the outlets are rated for. Duty cycle pertains to the amount of time needed in depositing weld material. It is expressed in percentage. For example, a unit with a 20 percent duty cycle at 180 amps and 220 volts means it can continuously work for two minutes, and eight minutes for cooling time. Thus, you should buy a MIG welder that has a high duty cycle. The ideal duty cycle for your welder would also depend on the task. For car repairs, for instance, a 30 percent duty cycle should be enough. Portability—small welders can weigh more than 70 pounds, so you should buy one with wheeled cart or wheels unless you want to have a strained back. Wire feed speed—this determines the speed and accuracy of the welding. Mig welders come in different wire feed speeds. This unit operates on a standard 110 volt power outlet. It’s a good mig welder for home and shop welding. It can weld up to 3/8 inch of mild steel, and is very simple to use. You’ll appreciate its clear and concise controls. It also comes with a spool gun that should make you weld with more precision.It runs on 0.25 to 0.35 diameter wire. The 0.35 tip is ideal for welding metals that are up to a quarter of an inch thick. Lastly, this weighs less than 60 pounds making it very portable and transport. You can even bring it for field-based welding jobs. But it does have its weaknesses. Perhaps the most disappointing is its wire feed system. It isn’t the most reliable that many owners complain it falls apart just an hour or so of welding work. And although the maker says that this unit can weld 3/8 inch metal, it would take a lot of passes for the unit to complete a join. This is another compact and powerful mig welder that I can recommend. It features a Tweco-style gun that is very easy to get used to. A lot of customers say they were able to master the gun after only a few times of using it. It has two power settings and is plug and play, meaning you can use it right out of the box. It has the distinction of being the only mig welder from Forney that is ready for use right out of the box. There’s a one pound roll of mig wire that is installed in this welder. Weighing less than 40 pounds, it is also very portable that you can use it both indoors and outdoors. Just make sure that there’s enough ventilation if you plan to use it indoors. It can also be used outside the house without you getting concerned about the weather conditions. Just be ready for the noise that it makes while in operation. It may not be suited for intermediate to advanced users, though, because its power output can’t be tweaked. But for novice welders particularly those who are into light automotive repair, this unit is highly recommended. This is also a user-friendly and compact wire-feed mig welder. It plugs right into a 115 volt wall socket. You can weld mild metal that are up to 1/8 inch thick with this unit. Included in the package are mask, work clamp and cable, wire plus gun, gas nozzle, gas hose and regulator, a spool of cable, and tactile hands shield. There are four voltage configurations that can let you weld mild metals, on top of the constant cable feed acceleration adjustment in this unit. The cable feed can handle the electricity and prevent overheating. It weighs just 49 pounds, thus it can be easily moved from one place to another. You can work inside the shop, or take it for some field-based work. It’s best used for light tasks like repairs and body work on car, among others. But it does have its weaknesses, like its safety tools not the best in terms of quality. It is also a unit that is not appropriate for heavy duty use. The mask included in the package isn’t the full-helmet type. You will have to hold it with one of your hands while welding. It is another compact mig welder that you would love to have for your DIY jobs. It’s a good choice for novice welders, and can be used for welding materials like stainless steel, aluminum, mild steel, and cast iron that are up to a quarter of an inch thick. 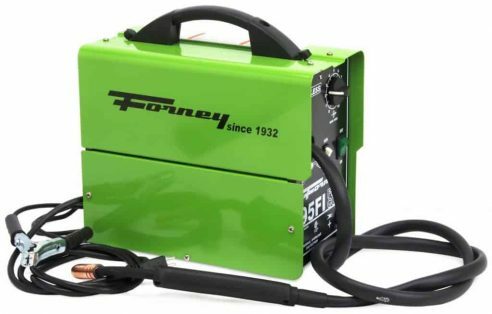 With a maximum output of 140 amps, this machine is something you will find useful for DIY jobs, auto body repairs, farm and ranch equipment repair, among others. It’s very user friendly and durable. You’ll get your money’s worth with this unit. It is ready to use out of the box, with a MIG regulator and gas hose. It weighs around 60 pounds. It has a large cabinet and an integrated cable wrap feature . The latter makes the welding unit easy to transport, aside from keeping the cable organized. The 10-foot long Twecomig gun is another nice feature. It allows the user to work on a welding task without transporting the entire unit to another wall outlet. Of course, this is not the most powerful welding tool out there. Its maximum output of 140 amps alone tells you that you can’t use it for heavy duty welding. It’s another welding machine that DIY enthusiasts will find very easy to learn. It has a maximum output of 175 amps, with a 20 percent duty cycle. At an output of 135 amps, the duty cycle increases to 30 percent. 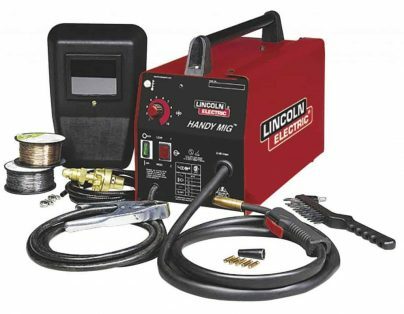 You can work on simple tasks like car repairs or farm machinery repair with this welder. 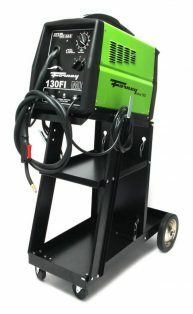 It can weld aluminum, stainless steel, and mild steel.There are plenty of things you will appreciate with this welder. One is that it is easy to set up. Assembly won’t take more than 10 minutes. It plugs into a 200 to 220 volt wall socket that you likely have in your garage. Safety is guaranteed with its temperature controller and overload breaker. It also has two automatic circuits to protect its wire feeder motor. This unit comes with a one year warranty. You just need to bear with the weight of the unit as it comes in at 80 pounds. The mig torch isn’t the longest too at just under nine feet long. Moreover, the cable isn’t the thickest but many users say that is a minor annoyance. 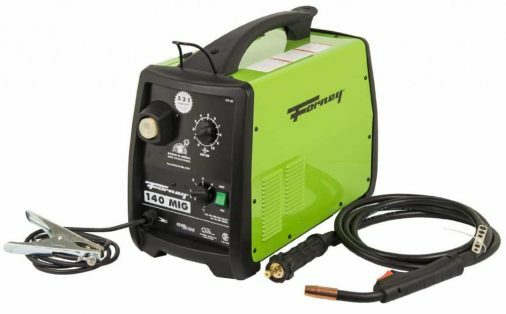 If you need a mig welder for small to medium sized tasks around the house without spending too much, then this is the model you should get. It’s among the most affordable in this list. But you will still get good performance with this welder. For starters, this welding machine is easy to set up. There’s a manual inside the package to guide you in assembly. You don’t really need to be an expert welder to put things together. There’s a sample spool core cable together with three replacements inside the package. You will also get a welding gun, face shield, brush hammer, and ground cable with clamp. This unit can be plugged into a standard 110 volt wall outlet. And because it is relatively lightweight at 40 pounds, you can transport it to a desired location pretty easily. There are two voltage settings in this unit. It can well all sorts of metals such as stainless steel, nickel, aluminum, magnesium, copper, and other alloys. You will have to be careful in welding soft metals, though, with this welder. The low setting on this unit is still too high, that it can melt soft metals pretty easily. The Forney 307 won’t keep you guessing on how to operate it the moment you take it out of the package. There’s no assembly required, and its control panel located on one side is easy to operate. There are only a few knobs to adjust for the settings.It weighs 53 pounds. It is not easy to tote around, sure, but it becomes more portable if you buy a wheel cart for it. It can weld mild steel, stainless steel, and aluminum, with up to a quarter inch in thickness. It has an output range of 40 to 130 amps. The unit features an internal cooling fan that keeps it cool even under extreme heat. It plugs into a 110 volt wall outlet. You can use it for small to medium jobs, like repairing home appliances, working on car exhaust, and other small items. This one is another unit that you can turn to for your DIY jobs. With a maximum output of 140 amps, it can work on small to medium sized jobs. It includes a spool gun that you can use for welding aluminum. You can use it, too, for welding mild steel and stainless steel.You’ll love that this welder is very user friendly. In fact, set-up won’t take more than 10 minutes. It has a thermal overload protection system designed to protect the unit. In terms of unit protection, it has an overload breaker and temperature control. There are also two automatic circuits for the wire feeder motor. Most of the user complaints are on the unreliable wire feed system of the welder. But aside from that weakness, this is a very solid choice for a mig welder. This is another exceptional mig welder that isn’t a bad choice for domestic uses. It comes with a 10 foot long, 150 amp spool gun. You can weld aluminum, mild steel, stainless steel, and flux core with this unit. 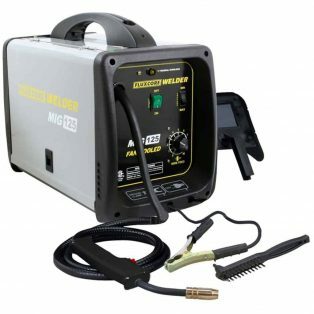 And it is possible to weld up to 5/16 inch of steel in a single pass with this mig welder.Many owners of this mig welder say it is versatile and highly useful for household repairs, auto body repairs, and even farm projects. It lets you use two different spool sizes that you can turn to for various projects. It’s also easy to get clean welds with this unit because of its enhanced magnetics and wire feed speed controls. With seven voltage selections available, you can make a steady arc with minimal spatters, resulting to a good bead appearance. When it comes to quality performance and durability, the Handler 210 MVP is among the best. You can use it for metal fabrication for home, farm, auto repair, and DIY jobs. Its output power ranges from a low of 25 amps to a high of 210 amps. It is thus ideal for both novice and experienced welders. It has a maximum duty cycle of 30 percent at 150 amps. It can be used for welding materials like aluminum, stainless steel, and steel. It has a multiple voltage plug for both 230 V and 115 V input. You can connect it to either of the two receptacles without the need for any additional equipment. Simply choose a plug that fits the receptacles, connect it to the system and you can start working. It’s very heavy at around 80 pounds, so you can’t really count on this welder for remote welding tasks. As you can see, there are tons of mig welders available for you. These mig welders are very much ideal for novice welders as they can be easily leaned. Most of them are ready to use right out of the box. And with the available tools on board these welders, you can work on DIY repair jobs, auto body restoration, and other small projects with relative ease.Just don’t forget to compare mig welder features, including their prices. Moreover, you should have at least an idea of the materials you are to bind together so you can get the right mig welder.